'Go anywhere’ vehicles like these 4x4 'truck buses' from fleet services company Sargent are on the march in the mining and resources sector. Hup two three, hup two three! 'Go anywhere truck buses' like these Sargent 4000 series 4x4 vehicles are increasingly popular on mining sites. Leading fleet services company Sargent is introducing 15 'go anywhere' specialist buses to its fleet for use across Queensland's coal seam gas industry. 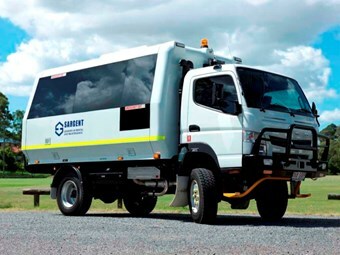 The 4x4 heavy duty off road vehicles, known as 'truck-buses', will be used by Australian Pacific LNG (APLNG) and Queensland Gas Company (QGC) to safely shuttle crews across project sites in the Surat and Bowen Basins. Sargent CEO Grant Chugg says demand for the specialised bus was growing as more gas projects came online with safety as an ongoing major focus. "We chose the 4000 series with 18 seats because it is better suited to the gas industry and the number of people they need to move at a time, and meets all the stringent transport safety requirements for pipeline projects," Chugg says. "Truck buses are in demand by the mining industry because of their reputation for safe operation, sturdy and long lasting construction and their ability to operate in extreme terrains. "The introduction of these 'go anywhere' vehicles to our fleet is an exciting new direction for Sargent and part of our strategy to become a leading provider to the mining and infrastructure industries." Ten truck-buses have been ordered for QGC and five for APLNG, with four currently in use by QGC. Sunshine Coast-based company All Terrain Warriors is building the vehicles to Sargent's specifications and all 15 buses are expected to be delivered by August. Chugg says the truck-buses had been modified to cope with extreme conditions as well as provide extra safety for crews. "The main modifications include a single rear wheel conversion which allows for a better ride and handling over common mining surfaces such as mud, greater fuel efficiency and means no more rocks stuck in dual wheels," he says. "The vehicles also feature roll over protection, collision avoidance and GPS tracking systems and parabolic spring suspension which delivers improved flexibility, stability, load capacity and shock absorption." The buses are also built for comfort with air-conditioning, a large aisle, wide seat bases, extra leg room and a waterproof interior which is able to be hosed out. "Additionally, the life span of the body of these trucks is between 10 and 12 years and around six years for the chassis, which can be easily replaced," says Chugg. "This works out to be extremely cost effective over a long term when compared to replacing entire vehicles or hiring numerous light vehicles to transport crews." Chugg says Sargent's new truck-buses are creating interest in other mining areas like Chinchilla and Dalby. "We look forward to supplying more of these vehicles to the industry in the future," he says.